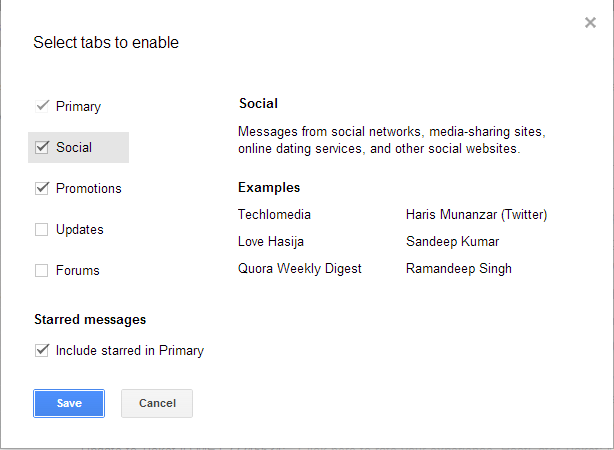 Few days back, Gmail announced new tabbed inbox to organize emails in different tabs. Now the Gmail tabbed inbox is live and is available for most of the Gmail users. If you are yet to get this inbox, please wait for few more days. If you are planning to use this new feature, you need to configure your inbox and add tabs. You can also easily mark emails for a specific tab. In this detailed post, we will see how to enable tabbed Inbox in Gmail and how to use it. 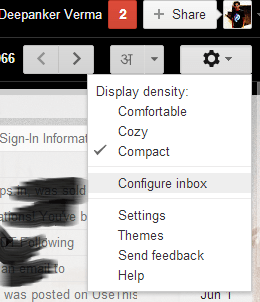 To enable this tabbed Gmail inbox, click on Gear icon and then choose the ‘Configure inbox’ option. If you do not see this, it means you are yet to get this feature. Keep checking back in few days. Now, you will see a pop-up inbox for selecting tabs you want to enable for your inbox. At present, you can only select tabs from the given list. You cannot create your own custom tab. After selecting the tabs you want to enable, click on save. Now you will see a new look of your inbox. Gmail has an algorithm that detects emails and delivers in appropriate tabs. You can also mark an email to go in a specific tab. You only need to drag and drop the email to a new tab. Whenever you move an email from a tab to another tab, Gmail also asks to deliver all future emails from that sender to this new tab. I personally love this feature because it helps me to organize my emails. This kind of inbox is really helpful for professionals who gets too many emails a day. Try this new inbox and share your views with us via comments.